The third and final version of the third installment of Capcom's flagship fighting game series. 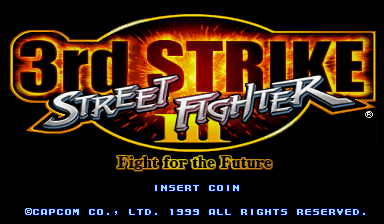 The SFIII series never came anywhere close to the same level of popularity as the original Street Fighter II, and was usually seen as a disappointment by people. And when 3rd Strike was released, it didn't really change any minds of people who wrote the series off. 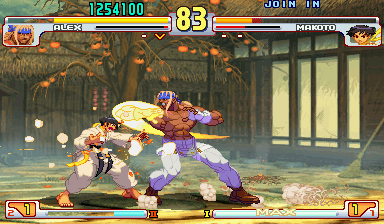 Despite this, the game still saw play in select parts of the world, namely Capcom's home country of Japan. Slowly but surely, people started coming around to the game over the years, with more people able to enjoy the game through console ports to systems like the Dreamcast, Playstation 2, and Xbox. But it wasn't until the EVO 2004 tournament, where one of the most memorable moments ever captured at a fighting game tournament lead to a true resurgence in the fighting game scene. Although it's lost some steam since then, there are still dedicated groups of players around the world that enjoy the game to this day. Although the CD-required romsets are now playable at MARP thanks to some WolfMAME-specific additions by our very own Barry Rodewald, we'll be using the sfiii3n No-CD romset for the sake of simplicity (plus it has a slightly shorter bootup time!). Do note though that this game is NOT playable in 0.106, so you will need to use WolfMAME 0.148 for this game. If you have issues running 0.148, please let us know and we'll do our best to assist you. We're now down to the semi-finals. Of the 4 players left, who will advance to the final game? Haha, now yes that I'm happy to have lost in the previous rounds thanks for keeping this in the last rounds. I would have fear even to try the first round of this beat. marpirc.net has been really sluggish as of the last day or so - it takes a long time to load pages. Just be patient and you'll get through eventually. I upload here my first score. Please BBH, look to see if it is correct. Works fine. Your score upon losing the last round was 1,815,700, but the "final score" ended up being 1,788,200. I forgot to mention that there is some weirdness in regards to what the game says is the final score, if you don't clear a stage then the score reverts to whatever your score was at the start of the stage... I think we should use highest score reached? Really wish the marpirc.net problems had cleared by now, but alas. This is really annoying. A little less than 38 hours to go in this round. 13 hours and 12 minutes left in this round! Congratulations RAX. I could not have overcome my record. It has been very exciting to play against you. I have given the maximum. Good luck in the final! Regards! RAX@AIVA and colman paolo qualify for the finals! nii-san and Goldtimes, you both are still invited to participate in the final round to officially determine 3rd and 4th place. Thankyou nii-san, we'll continue in StarForce our race. Whoa, at last a final, many attempts to get here. Congratulations to Paolo Colman , great scores again and again. Let's do our best in next turn. giro-X wrote: Haha, now yes that I'm happy to have lost in the previous rounds thanks for keeping this in the last rounds. I could have reached the final. Congratulations for Paolo Colman and Rax. You have deserved to play the final, no doubt.